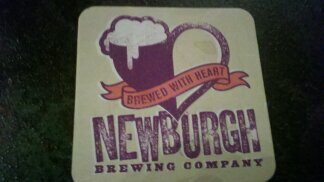 Let me start this off by saying I love Newburgh Brewing Company. Paul and Chris have something very special going on over there, and being that the brewery is only 10 minutes from my house, it's my "go to" tap room when I want fresh craft beer. I went to the brewery with my brother last Sunday (12/09/12), and I had 3 different offerings from the brewery. I will post my reviews of all 3 beers in subsequent posts, however, I will start in this post with Old Tjikko Baltic Spruce Porter which was released on 12/7/12. Appearance: Pitch black with a caramel head that is roughly 1-2 fingers thick. Genersous amounts of lacing that sticks firmly to the glass. Aroma: Strong, very strong pine notes. The pine notes fade out to chocolate and mint chocolate aromas. Taste/Mouthfeel: Full bodied beer, with a very thick feel in the mouth. This is what many would call a "chewy" beer. There is a medium amount of carbonation. The pine is overwhelming on the first sip, and it over powers whatever else is going on in the beer. After subsequent sips, the pine subsides a bit and allows the chocolate/roasted coffee notes to creep in a bit on the finish. The finish is also slightly bitter, with dark chocolate notes and hints of mint. However, the spruce notes stick around long after the finish and overpower the beer a lot. Overall: I can't say this is my favorite offering from Newburgh. They have a ton of great brews, but this one just isn't my thing. I love porters, but the spruce in this beer overpowers the tastes I commonly associate with porters (roasted/chocolate notes). I suggest everyone tries it, because it's quite the experience, but it's not for the faint of heart. This is definitely for beer connoisseurs looking to broaden their palettes. Stay tuned for my reviews of Newburgh's Unkel Dunkel (Dunkelweizen) and their Sterk Al Von Hoodie (Belgian Strong Ale).